The 5 best Latin America Stock Mutual Funds 2012 are BlackRock Latin America fund, Fidelity Latin America fund, etc. Find top performer equity funds. Latin America stock mutual funds invest mainly in equities from Latin America. These funds invest in countries such as Brazil, Mexico, Argentina, Peru, Columbia, Paraguay, Bolivia, etc. Some of the funds are also investing in debt obligations or bonds. This Latin America mutual fund is part of international stock mutual fund. The risks are higher for investment. If you seek to achieve long term growth, these funds are suitable for you. The Fidelity Latin America fund objective is to seek long-term growth of capital through investment in Latin American corporations. Adam Kutas is the fund manager. The annual expense ratio of this fund is 1.00%. The annual holdings turnover as of May 18, 2012 is 11.00%. This is lower compared to the average turnover in the category (40.02%). Morningstar analysts rated this fund with 4-stars rating. At the same time, it also has Neutral rating. It has total net assets of $2.99 billion. This Fidelity fund has YTD return of 8.32%. The fund was first introduced to public in April 1993. There is no fee for investing in this fund. Based on the load adjusted returns, this fund has returned 19.75% over the past 3-year and 17.78% over the past 10-year. As per April 2012, this fund has total of 79 holdings. The top holdings are America Movil SAB DE CV, Itau Unibanco Holding SA, Petrobras PN, Wal Mart de Mexico SAB and Petrobras Brasileiro SA. The JPMorgan Latin America fund is seeking long-term capital growth. It focuses its investment in securities of Latin America. It may invest in securities denominated in U.S. dollars, major currencies, and other countries’ currencies. Morningstar rated this JP Morgan fund with 3-stars rating. It has annual expense ratio of 1.89%. This expense figure is equal with the average in the Latin America Stock category. The 3-year beta risk is 1.20. Since its inception in 2007, this fund has been managed by Luis Carrillo. The best 1-year total return was recorded in 2009 with 109.98%. This Latin America stock mutual fund has 5-year average return of 4.75%. Investors, who are interested in investing in this fund, can open an account with minimum initial purchase of $1,000 and minimum subsequent investment of $25. The management fee of this fund is 0.25%. There is also maximum sales charge of 5.25%. The top 5 equities as of April 2012 are Cia de Bebidas das Americas ADR (5.4%), America Movil SAB de CV (5.0%), Credicorp Ltd (3.6%), Mexichem SAB de CV (2.8%) and Odontoprev SA (2.6%). 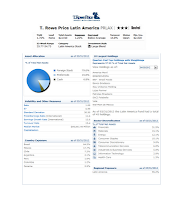 The T. Rowe Price Latin America fund invests majority of net assets (>80%) in Latin American companies with any size. It invests in >4 countries represented in the fund’s portfolio. It expects to invest in common stocks of companies located in the countries of Argentina, Brazil, Chile, Colombia, Mexico, Peru, and Venezuela. The fund is non-diversified. The mutual fund shares price is currently at $38.91 per share. This T. Rowe Price fund has total net assets of $2.01 billion. It provides 1.70% dividend yield for its investors. The latest dividend was distributed in December 2011 ($0.75). The fund has Neutral rating and 3-stars rating from Morningstar. It also has annual holdings turnover as of May 10, 2012 of 14.80%. Jose Costa Buck is the current fund manager. This is a no-load fund. Meaning there is no management fee or sales charge fee for investing in this fund. This fund can be purchased from 87 brokerages. This fund has recorded in 10 years of positive return and 8 years of negative return. The best 1-year total return was in 2009 with 114.36%. The top country exposure is Brazil (64.5%) and Mexico (17.7%). The top 10 largest holdings as of April 2012 represent 57.92% of the total net assets. 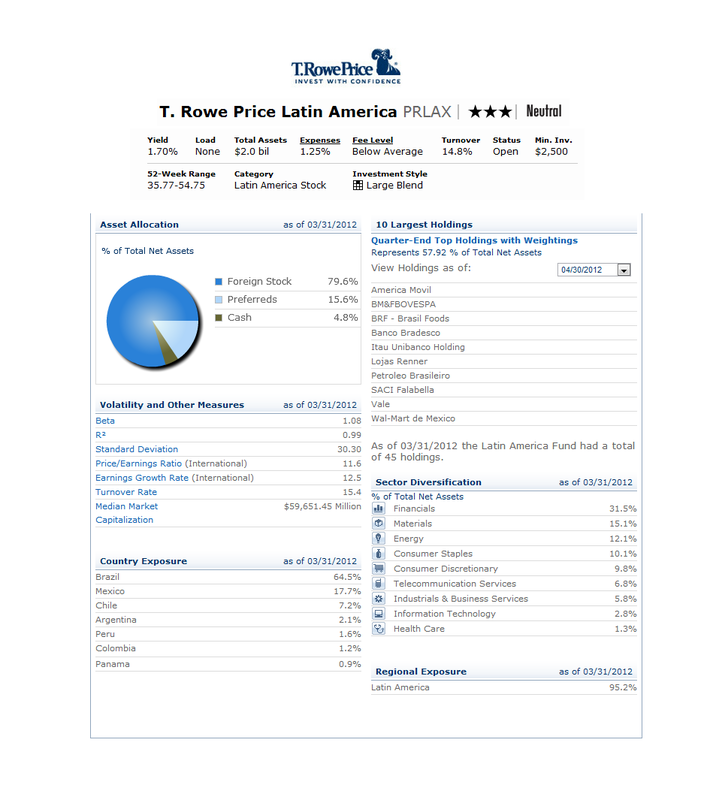 As of March 2012, this Latin America Fund had a total of 45 holdings. The investment aim of BlackRock Latin America fund is to provide long-term capital appreciation. It uses its assets to purchase Latin America stocks of any market capitalization. The fund will not seek to invest in a large number of countries in Latin America. It can invest in non-U.S. denominated stocks. It is not a diversified stock fund. 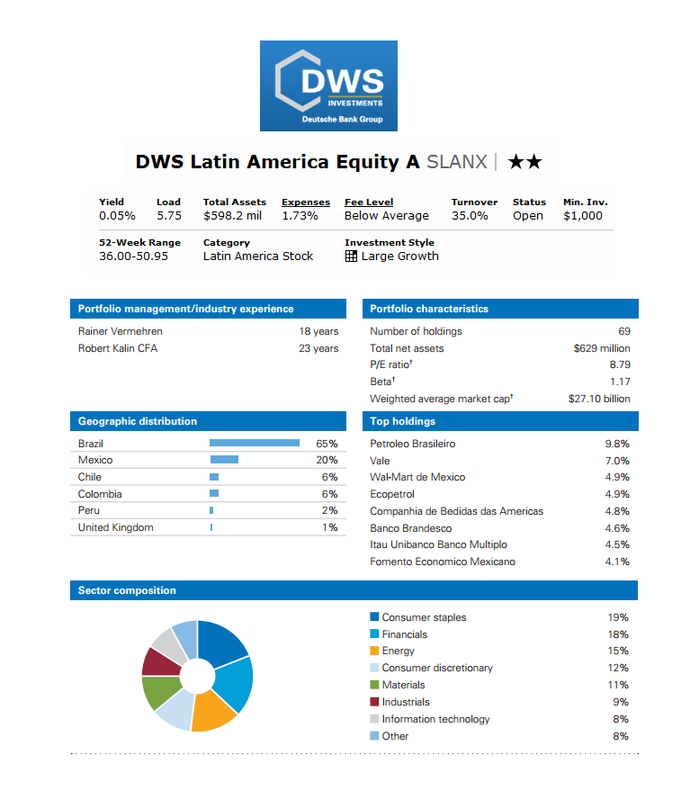 This best performer Latin America fund is currently managed by William Landers. He started managing it since September 2002. The total net assets are $749.52 million. It has just distributed the dividend for its investors in December 2011 ($0.30). The annual expense ratio is 1.55%. The fund’s NAV is $56.81 as of September 4th, 2012. There is a minimum initial purchase of $1,000 needed to open a brokerage account. The management fee is 0.25% and the maximum sales charge fee is 5.25%. It has 3-stars and Bronze rating from Morningstar. The YTD return is 13.58%. Based on the load adjusted return, it has returned 27.66% over the past 3-year and 18.98% over the past 10-year. You can buy this top Latin America stock mutual fund from 111 brokerages. The brokerage choices are JP Morgan, Vanguard, Merrill Lynch, Scottrade Load, E Trade Financial, Schwab Retail, etc. The top holdings as of April 2012 represent 11.00% of the total net assets. The top 4 sectors of this fund are Financials (22.8%), Materials (14.6%), Consumer Staples (13.8%) and Energy (13.4%). 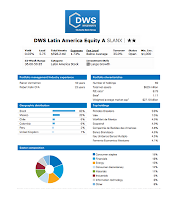 The DWS Latin America Equity fund utilizes its assets to buy Latin American common stocks and other equities. It may invest in junk bonds (grade BB/Ba and below) and other stocks. Rainer Vermehren has started managing this fund since December 2009. The fund has a very small amount of dividend yield (0.05%). This best Latin America mutual fund has annual expense ratio of 1.73%. The 12b1 fee is 0.24% and there is a front-end sales load fee of 5.75%. The fund requires a minimum initial investment of $1,000 for brokerage account. The YTD return of this fund is 9.74%. The fund has returned -18.67% over the past 1-year and 14.00% over the past 3-year. The other classes of this fund are Class C (SLAPX) and Class S (SLAFX). The benchmark of this fund is MSCI EM Latin America Index.